Government has earmarked some $150M for the completion of the Durban Park Project will has been taken under the wings of the Ministry of Public Infrastructure. Public Infrastructure Minister David Patterson at a press conference on Thursday noted that cabinet approved the monies at its last meeting and the Ministry will now be taking full responsibility for the project. The monies however will only be used for works from the present stage of the project. The source(s) of funding to take the project to its current state are still unknown. Patterson said that all of the funding would have been via donations; however he did not reveal who those donors were. The Minister revealed that construction works are expected to be completed in 21 days – which would make its completion date on May 12. However, additional cosmetic work would be done thereafter taking its final completion date to May 17. 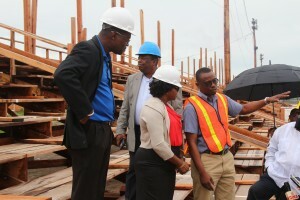 According to Patterson, work is currently being done by seven contractors and the venue will have the capacity to hold just about 18,900 persons. While monies have been approved by Cabinet, Patterson pointed out that government has not dismissed other options for funding and attempts will be made to secure a grant for the project.